The safe actions of all drivers help to ensure that our students travel safely to and from school. Students, parents/guardians, motorists, school bus drivers, Regional Centre staff and our enforcement partners share the responsibility for school bus safety. By working together, we will ensure that the bus trip is a safe one. 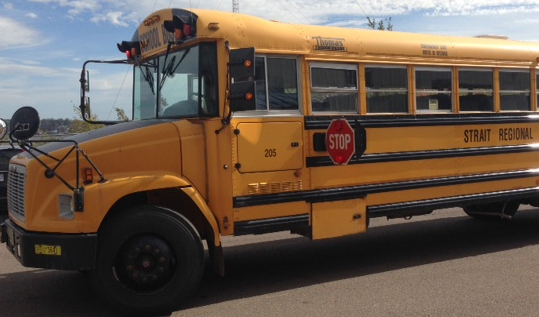 Staff of the Strait Regional Centre for Education deliver the annual student bus safety program to all Grades Primary to Six students. This program teaches students many aspects of bus safety including how to behave while on the bus, walking to and from the bus stop and how to get off and move safely away from the bus, to name a few. In addition, the Regional Centre has developed a brochure entitled, School Bus Safety: A Guide for Students and Parents/Guardians. The brochure also contains valuable information for families along with highlighting the rules of bus safety, student safety and evacuation procedures. This brochure may be accessed in the Document Depot section of the Regional Centre’s website, www.srce.ca. For more information and resources related to school bus safety, please access the Nova Scotia School Bus Safety website at www.schoolbussafety.ca and the Safety Services Nova Scotia website at www.safetyservicesns.ca.